Question：I received four tickets (each one-page) in one 4-page PDF file. Basically, I'd like to combine this 4-page PDF file into a 1-page PDF file the so that I can spend less ink and papers when printing. I'm not sure how to do this. Can you help? Answer: According to your question, there are two methods you can choose. Adobe Reader is a free application for viewing and printing PDF files. In Adobe Reader, you can print multiple PDF pages on a sheet of paper. Open the 4-page PDF in Adobe Reader, click File in the top menu bar and select “Print” to open the “Print” window. Select “Multiple pages per sheet” in the dropdown list of "Page Scaling” within the "Page Handling"panel. Select 4 in the dropdown list of “Pages per sheet”. Select your printer, specify other print options as appropriate and click the OK button. If you just want to combine the 4-page PDF into 1-page PDF to reduce the pages of the PDF for presentation and don’t want to print it, or if you want to print specific 4 page on a sheet of paper, you can try VeryPDF PDF Stitcher which allows you to combine multiple PDF pages into one PDF page and set page range, page size, gutter, margin, rotation angle, etc. for the combined PDF pages. Download VeryPDF PDF Stitcher and install it on the computer. Open the software and click Add button in the top tool bar to add the 4-page PDF into the processing file list. Click Choose button to choose an output folder for the output PDF. Select “Custom” in the dropdown box below “Pages per Sheet” and then set the number of pages per number of sheets on which you want to combine in the two edit boxes beside the dropdown box. Please see it in the following snapshot. Check one of the radio boxes in the “Order” group box to choose the order in which you want the pages to display. 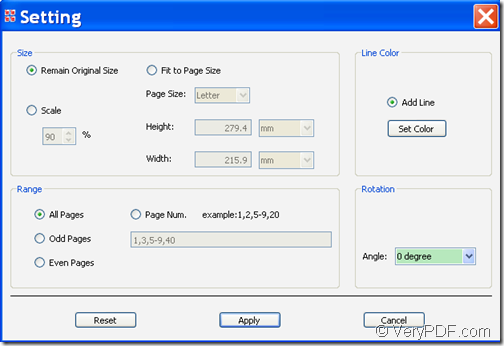 Set gutter and margin for the combined PDF pages in the “Gutter” and “Margin” group boxes. Click Setting button in the top tool bar to open the “Setting” interface. Please see it in the next snapshot. Set page size in the “Size” group box on the “Setting”interface. Set page range in the “Range” group box on the “Setting”interface if you want to combine some specific pages on a sheet of paper. Check the radio box of “Add Line” and click Set Color button to choose a line color for the gutter between the combined PDF pages. Choose a rotation angle in the dropdown list of “Angle”. Click Apply button at bottom of the “Setting”interface to save the settings. 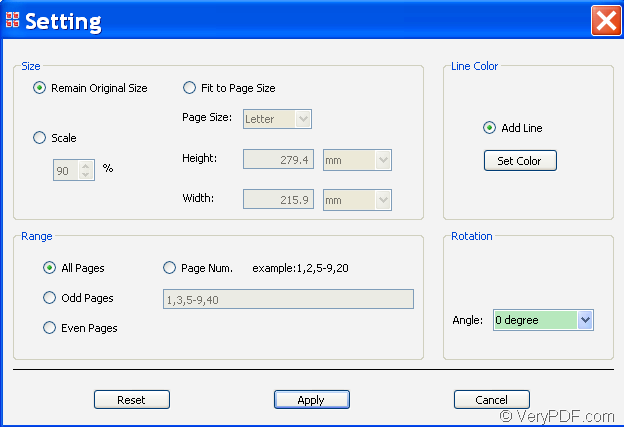 Click Start button in the top tool bar of the main interface to combine the 4-page PDF into a 1-page PDF. Please see the effect from the following snapshots. If you want to use this software, you can directly try and get VeryPDF PDF Stitcher here. This entry was posted in PDF Stitcher and tagged combine PDF pages. Bookmark the permalink.